We went to the beach twice today, once just to look and once to walk and look. There seemed to be more birds than ever, including a huge flock of sandpipers that were nestling into a long expanse of pebbles. Their shape and coloring were such that they almost seemed to be pebbles themselves. 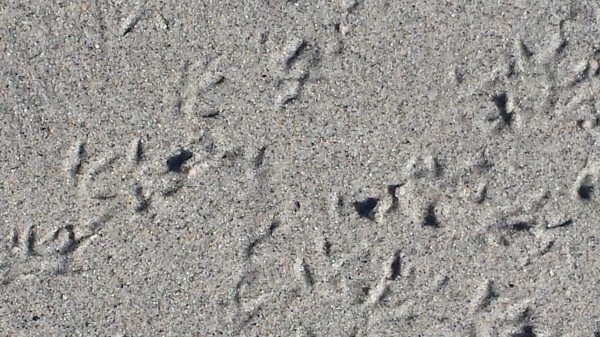 The footprints are small — and delicate. A single wave would probably erase them. Their distribution is dense enough to imply a large group, possibly shuffling themselves around. Jockeying for position? Settling in? These must be sandpiper prints; they are too small to belong to the gulls. They seem embossed rather than embedded. How?